We had Graphic Disorder create a new design for us to put on shirts and hoodies. 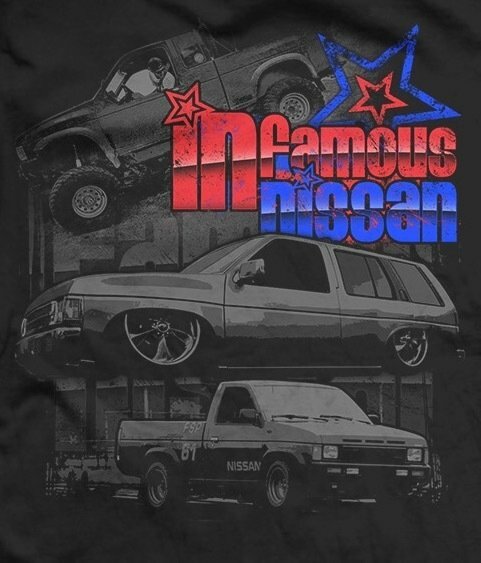 These shirts feature 3 of the baddest trucks on INfamous! Synbiotic12's truck is solid axle rock crawling monster. Ven's pathfinder is, without question, one of the cleanest on the planet. And FoulMouth's hardbody is a race proven testament to his expertise, with even better things to come. The front of the shirts features the INfamous INstar logo. Unfortunately this logo is only available on the regular shirts, not on the pocket T's or the zip-up hoodies. The PRE-ORDER will run through April 29, 2018. In the past it takes an additional month to have the shirts printed, shipped to me, and then shipped to the customer. I would anticipate the shirts being to the customer around the last week of May. Shipping charges are $2 per item. The prices are much higher now than they were 3+ years ago. Multiple ink colors and higher set up charges, in addition to the cost of the shirts. Especially the hoodies. Visit the INfamous Store to place your order! It's go time! I will have this up on YT soon! Ordered a couple things. Might add to that in a couple weeks. No, I see now what you're talking about. I kinda screwed up there, I used the same announcement I had used for the last shirt and edited it with the new info and pictures. Clearly I missed editing a portion of it in reference to the front logo lol. Only one design is available. But the zip up hoodies and pocket t do not have the INstar logo on the front. The art on the back is the same on all items. Is this through the same company that did it last time? And was it just me or do their hoodies run small? Last edited by WRLiv; 04-29-2018 at 06:44 AM. Yeah, same company. I never even wore one, I ended up selling the one I intended to keep so I’m not sure if they run a little small or not.